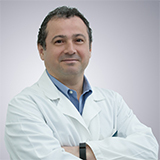 Dr. Erdal is a gynecologist specialized in Reproductive Medicine and IVF with more than 20 years’ experience. Before joining Fakih IVF, he was Director of IVI Istanbul, Centre for Assisted Reproduction (affiliated with IVI Spain). He has extensive experience in all aspects of human reproduction including: Counseling, work-up and treatment of infertile couples, hormonal treatment, IUI, IVF, ICSI, PGD and fertility preservation. He has special interest in treating couples with repeated IVF failure, recurrent miscarriage, endometriosis, and poor ovarian reserve. He has expertise in performing advanced surgical procedures using laparoscopy and hysteroscopy. Membership: Member of the American Society for Reproductive Medicine (ASRM), European Society of Human Reproduction and Embryology (ESHRE), and International Society of Ultrasound in Obstetrics and Gynecology (ISUOG). Education: Dr. Erdal obtained his Medical Degree from Istanbul University in Turkey in 1992, then competed his specialty in Obstetrics and Gynecology at the same University hospital in 1997. He was a postdoctoral research fellow at Center for Research on Reproduction and Women's Health (CRRWH) at the University of Pennsylvania (1997-1998). Between 2004 and 2008, Dr. Erdal attended subspecialty training in Reproductive Medicine and IVF at Instituto Valenciano de Infertilidad (IVI Valencia, Spain) a well-known center with one of the largest IVF programs in the world. Between 2013-2014, he received further training in Reproductive Medicine and Endoscopic Surgery at the University College London Hospital (UCLH) in the United Kingdom.